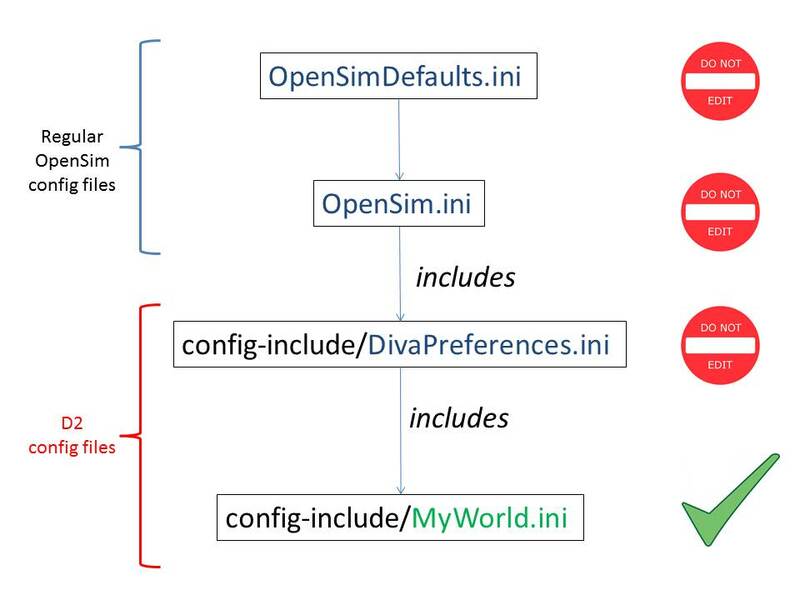 Last week I packaged a release of the Diva Distribution (D2) for OpenSimulator 0.7.4. I’m glad to see that D2 continues to be very popular. Not just there’s already a large number of downloads, but other distributions such as sim-on-a stick also continue build on it. D2 is very easy to install because of the Configuration tool that comes with it. It’s also very easy to keep up-to-date because of the Update tool that is included. Nevertheless, medium-to-advanced users of D2 often want to change a thing or two from what comes in the package. One thing that I often hear is people not wanting to use mega-regions and, instead, wanting to use plain regions. Another thing I often hear is wanting to add more regions. These are all perfectly good things to do with your D2 installation. However, there’s the wrong way and the right way of changing the default configurations. If you change them the wrong way, things may work fine for a while, but they may break in the next update. This post explains the right way of changing the D2 configurations. Published by Diva Canto, in D2, did you know?, diva distro. Like many of you, I read Maria’s article last December saying that Vivox was giving free voice service to small OpenSim worlds. I thought that was a nice gesture, but I confess I found it hard to believe, so I didn’t act on it. Until yesterday. I decided to give it shot, because my projects could really use inworld voice, and I had nothing to loose just for asking. Yesterday was Sunday. To my surprise, I got a reply within 1 hour of my request. I filled out the license agreement. This morning an email was waiting for me with the precise instructions, down to the lines that I needed to add to my .ini, and a link to the blog post that Kitely wrote on how to enable voice. I just had to copy-and-paste the config, and I had voice working in 10 minutes! — 9 of which were spent figuring out which buttons to press on the viewer to enable voice all over. I couldn’t believe it! Someone at Vivox must really like OpenSim! Wow. D2-ers, don’t miss out on this fantastic opportunity! See Maria’s article and take it from there. No need for complicated and costly licenses. No need for horribly complicated and fail-ful Freeswitch installations. Small worlds just got as powerful as the big ones — or even more powerful, because big, commercial worlds need to pay for the service, and the small ones don’t. At least for the time being. Published by Diva Canto, in Uncategorized. I usually don’t write about the future, I prefer to write about things that are already done and working. But I’m going to make an exception, because people are starting to ask about configurations of the Hypergrid that pertain to the next level; we’re almost there, but not yet. I am going to give an overview of what’s in the works right now that will result in the next big bump in the HG number: the big two-point-oh. Published by Diva Canto, in Hypergrid, OpenSim. Hi everyone! I’m happy to announce the personal Hypergrid Teleporter! Its goal is to make your Hypergrid travels a bit easier and more enjoyable. Get it here as iar. Hi everyone! I finally had the time to put together a new diva distro release corresponding to OpenSim 0.7.2 — plus a few minor bug fixes over that. If you already have a d2 world, you know the drill: run Update.exe. Otherwise, grab the zip, unzip it and take it from the README file. If you’re upgrading, I highly recommend running the Configure tool on the new installation, and you’ll see why. There are many improvements in OpenSim, most notably the new LSL NPC stuff — this allows you to create and manipulate Non-Player Characters (bots) directly from scripts. Really cool! P.S. I also made a new release for Wifi that works with Robust 0.7.2. Enjoy! Published by Diva Canto, in D2, diva distro, Hypergrid, OpenSim. 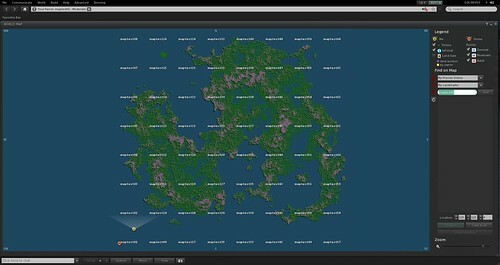 Over the weekend, I added the machinery for the new V2 map to work with vanilla OpenSim. If you want to try it out, watch out for the several changes in configuration files, especially those in .ini.example’s — make a diff to see what changed. Published by Diva Canto, in OpenSim. If you have been using the Hypergrid you probably heard about the 4,096 “bug.” This post explains what the “bug” is about, how it manifests itself, and how I came to peace with it. It’s also a call for action for grid operators to consider placing their grids below cell 4,096-4,096 on the map. Starting in the previous release, D2 worlds are placed around 2,048 by the configuration tool. Published by Diva Canto, in OpenSim, Second Life. Over the past few weeks I have been working on mechanisms for making friends and instant message work across the Hypergrid. These social functions have been a goal since the beginning of the Hypergrid. The big rearchitecture work we did in OpenSimulator 0.7 that strengthened security was also meant to support these functions, but, of course, we weren’t really sure how well the new architecture would hold when these functions were actually implemented. Well, now I know — it handles it just fine. Let me explain how friends and IM work over the HG, the challenges, and the current limitations. Keep in mind that these new functions are still experimental, and subject to changes and improvements. It has been a while since I made a D2 + Wifi releases. I had been waiting for OpenSim 0.7.1; the changes between 0.7.0.2 and 0.7.1 were such that I didn’t want to risk making a release in between. OpenSim 0.7.1 finally happened earlier this week, so here is the much awaited D2! Technically, it corresponds to OpenSim r15402, which is a couple of commits after the official release — I found a couple of bugs in the official release related to the Library, so I fixed them. Published by Diva Canto, in D2, Hypergrid, news, OpenSim. It’s no secret that I have been fairly impressed with Unity3D. I find it extremely liberating in comparison to Second Life’s (and any other MMO) pre-packaged notion of what online 3D environments should be. I had to give a talk yesterday, so I used that talk as an excuse to taking my knowledge of Unity3D to the next level. 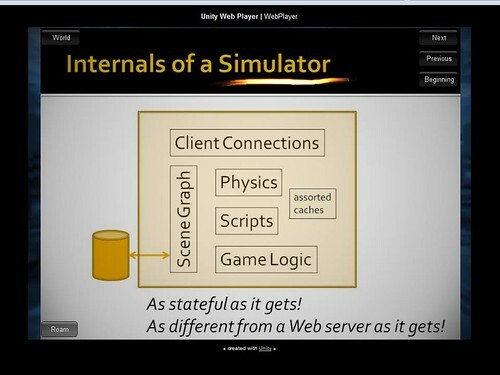 I decided to make my presentation in Unity3D, and have the audience be part of the presentation at some point — similar to what we see in SL/OpenSim, but with the experience on the Web browser and under my complete control. Go here to see the result. Let me explain what you see there. Published by Diva Canto, in 3d modeling.